What the Israelites heard at Sinai has become known as the “Ten Commandments.” But this description raises obvious problems. First, neither the Torah nor Jewish tradition calls them the Ten Commandments. The Torah calls them aseret hadevarim (Ex. 34:28), and tradition terms them aseret hadibrot, meaning “the ten utterances.” Second, there was much debate, especially between Maimonides and Halakkhot Gedolot as understood by Nahmanides, as to whether the first verse, “I am the Lord your God …,” is a command or a preface to the commands. Third, there are not ten commandments in Judaism but 613. Why, then, these but not those? Next come the stipulations, first in general outline, then in specific detail. That is precisely the relationship between the “ten utterances” and the detailed commands set out in later chapters and books of the Torah. The former are the general outline, the latter, the details. 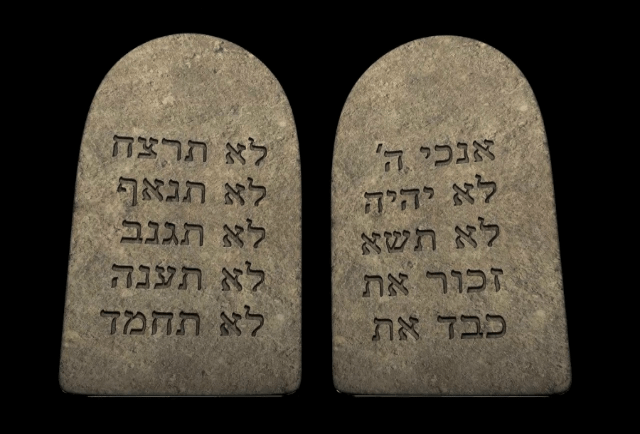 So the “ten utterances” are not commandments as such but an articulation of basic principles. What makes them special is that they are simple and easy to memorise. That is because in Judaism, law is not intended for judges alone. The covenant at Sinai was made by God with an entire people. Hence the need for a brief statement of basic principles that everyone could remember and recite. Usually they are portrayed as two sets of five, the first dealing with relationships between us and God (including honouring our parents since they like God brought us into being), the second with the relations between us and our fellow humans. However, it also makes sense to see them as three groups of three. The first three – No other gods besides Me, no graven images, and no taking of God’s name in vain – are about God, the author and authority of the laws. The first states that Divine sovereignty transcends all other loyalties (No other gods besides Me). The second tells us that God is a living force, not an abstract power (No graven images). The third states that sovereignty presupposes reverence (Do not take My name in vain). The second three – the Sabbath, honouring parents, and the prohibition of murder – are all about the principle of the createdness of life. Shabbat is the day dedicated to seeing God as creator, and the universe as His creation. Honouring parents acknowledges our human createdness. “Thou shall not murder” restates the central principle of the Noahide covenant that murder is not just a crime against man but a sin against God in whose image we are created. So the fourth, fifth and sixth commands form the basic jurisprudential principles of Jewish life. They tell us to remember where we came from if we seek to know how to live. Finally comes the stand-alone prohibition against envying your neighbour’s house, wife, slave, maid, ox, donkey, or anything else belonging to him or her. This seems odd if we think of the “ten words” as commands, but not if we think of them as the basic principles of a free society. The greatest challenge of any society is how to contain the universal phenomenon of envy: the desire to have what belongs to someone else. Rene Girard, in Violence and the Sacred, argued that the primary driver of human violence is mimetic desire, that is, the desire to have what someone else has, which is ultimately the desire to be what someone else is. Envy can lead to breaking many of the other commands: it can move people to adultery, theft, false testimony and even murder. It led Cain to murder Abel, made Abraham and Isaac fear for their life because they were married to beautiful women, and led Joseph’s brothers to hate him and sell him into slavery. It was envy of their neighbours that led the Israelites often to imitate their religious practices and worship their gods. We are here because God wanted us to be. We have what God wanted us to have. Why then should we seek what others have? If what matters most in our lives is how we appear in the eyes of God, why should we seek anything else merely because someone else has it? It is when we stop defining ourselves in relation to God and start defining ourselves in relation to other people that competition, strife, covetousness and envy enter our minds, and they lead only to unhappiness. Thirty-three centuries after they were first given, the Ten Commandments remain the simplest, shortest guide to the creation of a good society.